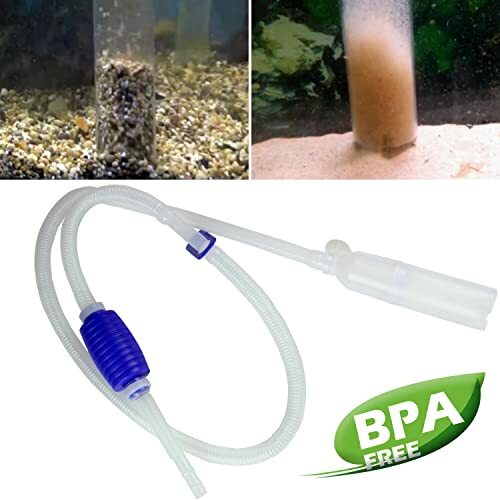 While aquarium filters can only remove the left fish foods and solid wastes in the water, gravel vacuum cleaners (siphon or python water changers) help to remove sludge deposited deeply in gravel or sand substrates. The sludge in the substrate, if excessively accumulated, is a rich source of nitrogenous toxins that are harmful to fish and aquarium lives. 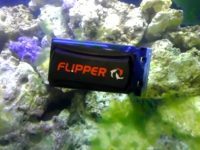 Keeping the aquarium substrate clean is an essential work to maintain a healthy fish tank and the gravel cleaners are designed to do that work. Before reviewing the best cleaners, let us define what this important equipment is and how it works. What is a gravel vacuum cleaner & how it works? 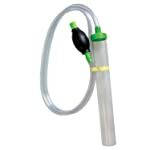 A gravel vacuum cleaner (or siphon) is a simple piece of equipment used for aquarium water changes. 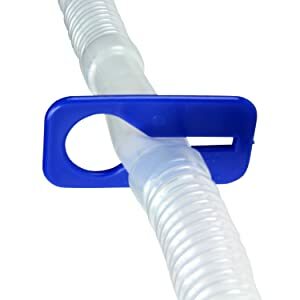 Most of these gadgets consist of a rigid, plastic tube (about 20mm in diameter) attached to one end of a siphon tube. 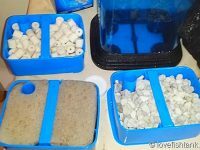 This allows you to clean your aquarium gravel each time you make the water change. The cleaner is used to remove uneaten food items, fish waste products, and stubborn aquarium plant debris. In doing so, it also balances the chemical levels in the gravel to encourage the growth of beneficial bacteria. A gravel vacuum cleaner works by churning the gravel around in columns of moving water. This loosens and carries off any stubborn debris that might be attached to or trapped by the gravel. A siphon provides the power that operates the vacuum cleaner. The siphon will also carry off the debris. The first step in vacuuming your gravel is to get the siphon started. Most gravel vacuum cleaners come with user manual containing easy to follow instructions on how to do the cleaning. 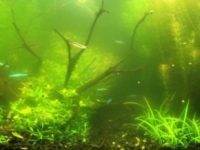 Many models of aquarium vacuum cleaners are currently available in the market but not all work perfectly. We are going to provide you with reviews of some of the best brands in the market and give you the reasons why you should choose them. The Genuine Terapump aquarium cleaner is made in Korea. The cleaner is lightweight, portable and made from BPA-free heavy-duty material. It qualifies as the cheapest, simplest and easiest to use cleaner you can find in the market. The patented design makes it ideal for filtering dirt in both sand or gravel to be discharged along with water without hurting your fish. All you need to do to start the siphon is to squeeze the manual pump. It comes with two nozzles: a longer nozzle for gravel cleaning and a shorter nozzle for water drainage only. Use only the shorter nozzle if you want to change the water only and use both of the nozzles if you want to clean the gravel. There comes a flow controller for lowering the water flow inside the siphon when you need to clean sand as well as other fine substrates. Its delivery volume is 1.5 gallons per minute and measures 64″ in total length. The suction tube length is 5.6″ that makes it an ideal gravel cleaner for small Betta fish tanks or 1-5 gallon tanks using sand or gravel substrates. If you want a multipurpose equipment that can help you with overall aquarium maintenance then you have it in Python No Spill Clean and Fill aquarium maintenance system. As you may imagine from the name, this system allows you to perform your mandatory aquarium maintenance with no siphons, no buckets, and no worries of tank teardown. 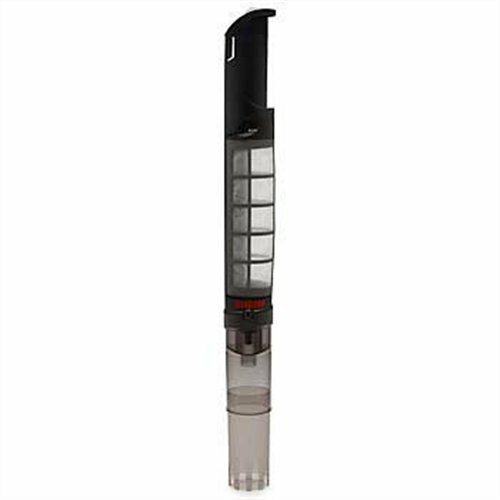 This ready-to-use aquarium vacuum cleaner adapts easily to standard faucets and makes water changes easier. It drains and fills the fish tank without disturbing the fish, plants, or décor during your routine maintenance. It comes with a T connector (green one in the picture) to connect the faucet with the python. There are a valve in the T connector and a valve in the gravel suction of the python. It is very easy to use the python water changer. Once you assemble it following the provided manual, just attach the system’s faucet valve to your faucet. First, you need to ensure that the faucet you are using should be at the same level or lower than the aquarium and has good water pressure. Connect the python with the faucet, then turn on the water. 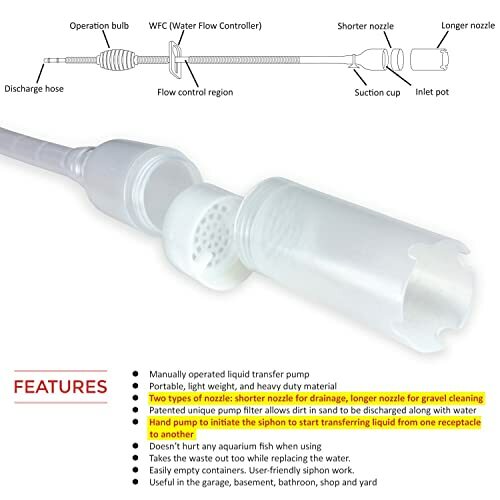 Water from the faucet will flow inside the T connector to make a suction force that is strong enough to start the water flow from your aquarium to the sink. 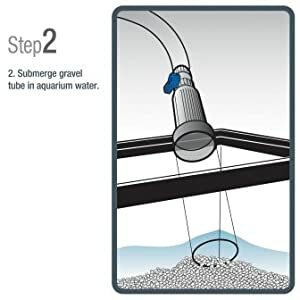 To clean the aquarium gravel, ensure that the water is being pulled from the aquarium to the sink then insert the intake tube into the aquarium substrate to clean it. You can adjust the control valve at the intake tube to regulate water flowing from the aquarium to lift and agitate gravel enough to remove dirt and debris but not wipe out the gravel or sand. To refill your tank after the cleaning, only shut off the valve at the T connector. That is essentially how this system works. It comes with a 10-inch gravel tube; however, you can buy a 24-inch replacement to clean most tank sizes from small to large without getting your hands wet. For very large fish tanks over 100 gallons, you can use a “36-inch” or “48-inch” one. There are also many accessories coming from the same manufacturer that are compatible with the python for your maximum customization to meet your needs. 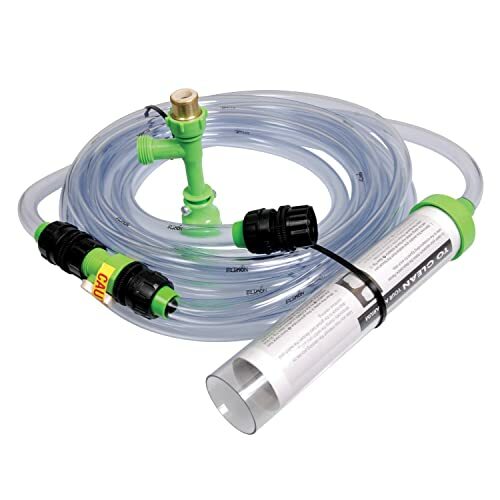 All the great features are included in the python water changer that reasons why it is very popular and loved by many hobbyists. 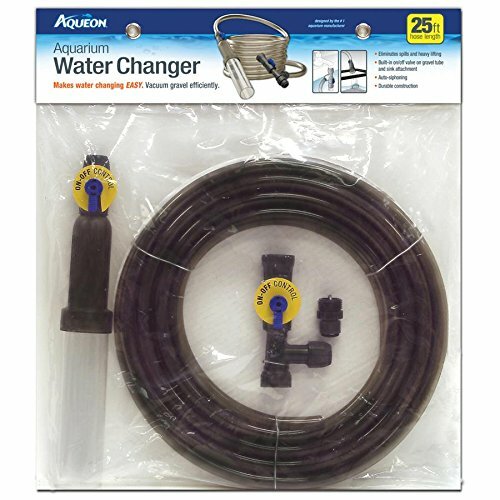 Aqueon aquarium water changer works exactly like the Python aquarium maintenance system reviewed previously. 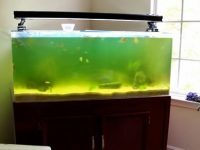 It is designed to take mess and dirt out of your aquarium with each water change. It switches easily from a gravel vacuum to a water changer by a simple twist of a valve. It features a water flow controller in the gravel suction which provides the correct water flow to agitate gravel thereby eliminating any stubborn dirt and debris that might be in the gravel while at the same time preserving the gravel and sand in your aquarium. It measures 25 feet giving enough length to connect your aquarium to sinks in your home. This facilitates thorough cleaning, prevents spillage and eliminates the need to bear the weight of heavy baskets. Your aquarium water changing messes will never worry you again if you use Python aquarium maintenance system. 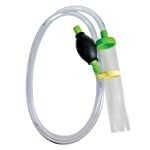 Another simple, effective and pocket-friendly aquarium vacuum cleaner is the Python Pro-Clean siphon kit. The gravel suction tube of the kit is a component of the Python No Spill reviewed previously; however, it comes with a siphon squeeze and is used for cleaning gravel and removing water only, not filling. It is very simple to use and sufficient in itself. Just squeeze the siphon squeeze and the suction pressure thereof will start the siphoning process. The siphon pressure effectively separates and removes debris from your aquarium that maintains chemical balance and encourages the growth of helpful bacteria. All you will need, in addition, is a bucket for the water change. Unlike the gravel cleaners reviewed above, the Eheim Quick Vac Pro works much differently. It does not siphon operated and does not use hoses or buckets. It is designed to pick up dirt particles, eliminate sludge and deposit them into the super-fine mesh cartridge for later removal. It is powered by battery and works with the press of a button. To use it, just insert the suction end into your aquarium gravel. Water suction will then lift the waste up to deposit it in the superfine mesh cartridge. The cartridge traps even the tiniest particles while at the same time letting water back to the aquarium. The mesh cartridge is detachable for easy cleaning. The tool is submersible up to 3 feet. The battery can operate continuously up to four hours. 1. 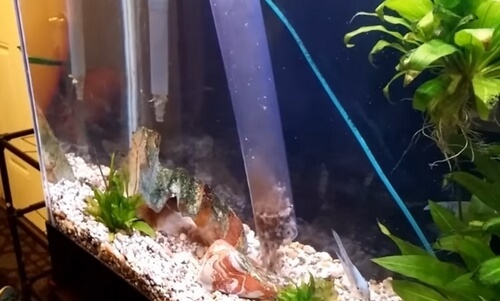 Qn: How do I use aquarium gravel vacuum cleaner? Ans: After assembling the tool, simply squeeze the operation bulb five to seven times on the tool to start the siphon. for using the python, please read the guide mentioned in the previous sections. 2. Qn: Can I use gravel cleaner on sand? Ans: Yes, you can. You can do it by adjusting the flow rate by using a water flow controller attached at the flow control region (see the following picture, it is the water flow controller of the first product in this review). For python or Aqueon water changer, there are control valves for you to adjust the water flow. 3. Qn: What size of gravel cleaner do I need? Ans: The height of your aquarium should be your leading factor. The higher it is the taller the gravel suction you will need. 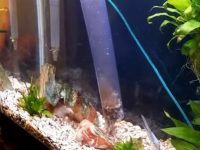 24-inch is the great length of a gravel suction that is taller than the heights of most aquariums under 100 gallons and offers you to clean your aquarium without submersing your hands into water. 4. Qn: Which gravel cleaner is the best? Ans: Python No Spill Clean and Fill is the best one to use. It works well and can achieve dual purposes – both clean and fill functions. 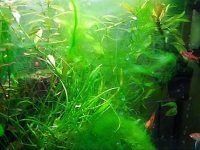 However, if you are looking for the simplest to use, you can go for Genuine Terapump aquarium cleaner.